Some kids in class are high readers. Meaning that when the rest of the class is learning phonics and phonemic awareness and saying short o sounds, these kids are bored. So the cooperating teacher split them from the class: they are now doing different, more challenging reading. Since we read Stone Soup in class, and I had a reader’s theater skit for Stone Soup from my University class, we decided to do it with them! It is so interesting how seeing a story in a different format creates a challenge. Kids are trying to understand that the character’s names (listed in bold on the side) are not to be read, the verbs in parenthesis don’t need to be read but acted out (ex: laughing), and one must follow along the lines diligently if the skit is to go smoothly. It is interesting for me to observe how they’re being challenge. Today we will practice some more reading together and then individual parts. I suppose it’s easy to turn any story into a reader’s theater. Kids get a chance to practice reading fluently and with expression. The whole clincher is when they get to present it in front of the class! I was reflecting on my school lessons and wondering how quickly can they be improved. There is a certain amount of growth that needs to take place before I can expect myself to be great teacher. The training period of when I’m learning and putting in effort, in order to do something impressive, can be difficult. It made me think of the time I ran half-marathons. It all began when a few girls decided to do a fun activity together. Instead of going out to fancy restaurants, we decided to do something more challenging: we signed up for a 5k (3.1 miles) run. This would require us to train, we would get to participate in this group effort, and we would get shirts on top of that. So my training began. I couldn’t run for more than a few minutes without stopping to walk a few minutes. After a few months, however, I could run a few miles with no problems, and had a blast running in the event. There were cheerleaders cheering the runners on along the way and lots of goodies, free samples and snacks afterwards. Definitely worth it, by the way. Then I signed up for another 5k a few months later and had a blast again. My husband was a big supporter: even he signed up and ran this one, even though he would rather do anything else other than running! My sister in law ran a half marathon that summer and loved it so much, she signed up for another one in the fall. I decided to give it a shot too. I mean, how tough would it be to run 13.1 miles? Well, it was a lot more tough than I ever imagined. Running for 30 minutes is one thing, but training one’s body to run for about two consecutive hours is a whole different concept! I downloaded an app to train for a half marathon in three months. It was a very personalized plan where I would have one long run scheduled each week, and then short runs and other exercises throughout the week. I think the goal was to increase the distance by around 10-15% each week. My muscles were sore at first, and my joints ached. But interestingly enough, I began to enjoy it. I looked forward to the mornings where I could run out, reflect on my life, pray, and clear my head. I had about a month left before the big day, and my husband and I were going to Europe. Because I wasn’t planning on training there, I decided to increase my distances. I was able to complete the distance of 13 miles, and I felt successful. There was a just a minor annoyance: my knee started experiencing some pain (which I chose to ignore). In Europe, there was no running. It was two weeks of exploring five countries (more posts about that later), tasting new foods, going on bus rides, and walking on foot. So much walking on foot, in fact, that I was rotating three pairs of shoes because of blisters. We walked between 5-20 miles daily. Unfortunately, I didn’t feel that contributed to my training for the half marathon. When I returned, I decided to “make up” for the running I skipped out on. I ran the distance of half marathon twice in a week. My knee was crying out in pain, and I finally got worried. The pain was so intense that I couldn’t even run a mile without wincing. So for the last week before the race, I rested. The day of the race, I was pumped and ready to go. I bought some stretchy wrap to wrap my knees around and keep them tight. And off I went! Except that within minutes of beginning, my knee felt sharp shooting pains, and I couldn’t run. For several miles I ran a minute until I couldn’t move my legs, then walked a few minutes until the knee rested, then ran again, and so on. I cried. Then I remembered the wraps for knees which I left in the car. I texted my husband, and oh God bless him, he said he would bring them out. But he didn’t know where I would be on the route, so he began running back from the finish line. He reached me at about mile 9, I wrapped up my knees, and hobbled the remainder of the run. Took me about 3 hours. It didn’t matter that the route was incredibly beautiful: it was one of the most experiences of my life. But, I was determined to replace a negative half-marathon memory with a positive one, so a week later I signed up for the Rock&Roll Half Marathon. That gave me about seven months of training. I rested completely for about two months, and began biking and doing the elliptical. Running was still painful for my knee. Very slowly, I tried later, one minute of running, then two, then three, then a mile, then walk for a long while, then a mile again. If I felt anything unusual in my knee, I wouldn’t run for at least a week or two. The majority of my training this time did not consist of running. The day of this run, I started off slowly and walked a few minutes after each mile. About two-thirds in, my knee began to act up, so I stopped running and finished walking. Timing-wise, it was maybe ten minutes less than what the first half-marathon was, but the experience was incredible! I enjoyed it, I completed it, and have a medal that proves it. The lesson from this long passage is that if there is a goal, I have to work for it. I can’t take short-cuts and attempt to condense something that requires time. It won’t result in reaching the goal appropriately. Even if though the goal was reached, was it really worth it? Yes, dedication and perseverance is important, but being realistic is crucial. For my teaching, I can’t expect to me exactly like my cooperating teacher yet. It will take years of practice and learning, I will learn as much as I can, and will put in as much effort as I can without driving myself nuts. I love crepes. 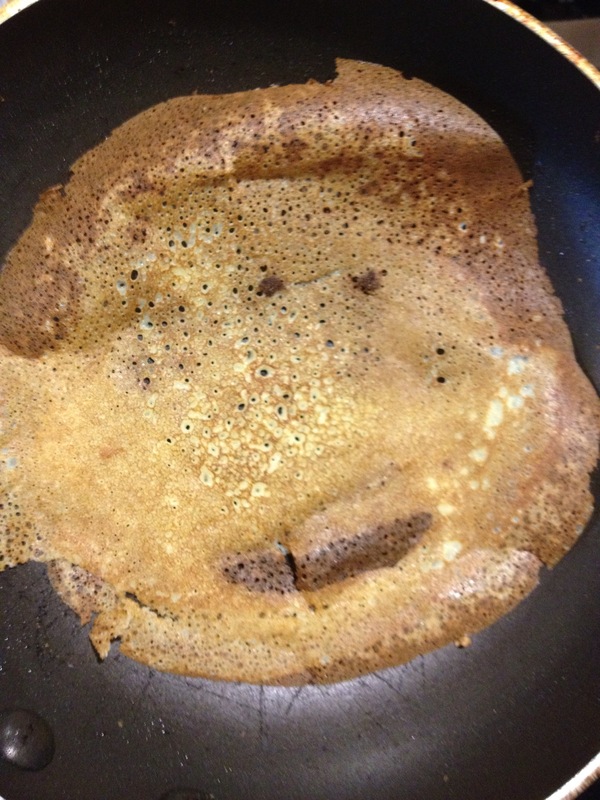 So I finally bought some rice flour and corn starch and began making crepes. Let me tell you, as a crepe expert, these are really something incredible! They are very fragile, soft, and oh so scrumptious! I’m happy to report that they taste better than any crepes I’ve made with wheat flour. Mix everything, heat pan on medium, pour in batter, swivel it around, flip, and remove from pan. Roll up crepes with filling, place in buttered pan. Drizzle generously with condensed milk. Cover with foil; remove last five minutes of baking. Bake 20-30 minutes. The more you bake it, the more caramelized it will become. For a ridiculously sweet dessert, scoop on some Nutella over the crepes. This recipe can have more/less sugar, or more/less butter, or be substituted with olive oil (won’t be as soft or fragile in this case), depending on what you’re feeling. The filling can also be more or less sweet; this is just the latest amount of what I used. Toast pecans and almonds in 350 degree F oven for about 10 minutes. Melt a bit of butter, add a pinch of salt, add maple syrup and maybe a drop of vanilla; mix in with nuts. Bake in 325 degree F for about 15 minutes. Update on the student who has selective mutism. She is expected to participate in class. If she chooses not to say “good morning” to her neighbor in the morning circle meeting, she is still expected to shake students’ hands. If all students need to participate in a circle type activity, my cooperating teacher will ask her a question that can be answered in a “yes” or “no” way, and the student is expected to nod or shake her head. She had arrived a day before school began and was instructed to choose a desk and who will sit with her in her group. She then helped make nametags for all the students in class, carry out bins of supplies to each group, and wrote her name under the categories on the board to indicate how she goes home. This helped for her to make an investment into the class. The teacher also practiced nodding and shaking of head to ensure the student understood the expectations of participation. She is giggly, bright, and definitely on top of it. Just doesn’t speak. Yet. When students leave for the day, I was giving out high-fives, and she declined. However, the next day, she did it! The tough part about this is that we don’t have her reading assessments completed. We are working on doing something online, where she can read it at home and record it, or into a microphone, or some other alternative method. In my opinion, she doesn’t seem to suffer from a lot of anxiety and gets along well with other students. Act! Have fun! Be on stage! Don’t evaluate students’ answers; if incorrect, ask follow up question. Students can be acknowledged for answering “thank you” but don’t say “good job!” and then omit it for another student’s answer if it isn’t correct. Connections are better, explaining vocabulary words and helping them tie in with what was learned earlier that week and how it relates to this lesson, utilizing vocabulary words and terminology in the lesson. Pulling names from sticks = ensures better participation because kids don’t know who’ll be called on next. Holding kids accountable: if don’t know answer- pay attention because will need to restate what the next student will say. That’s it for this time; off to school! Math lesson #2 went better: I had more control of the class, my pacing was much more appropriate, and student seating was planned out. Think about manipulatives: what are students doing after done working with them? Explain the need to put away, etc., before beginning next task. Giving quiz: show it on doc camera and read directions with them. Show where name goes. Do not give out answers. Say they already know the answer (because they’ve been working on this all week). I need to SPEAK UP. My voice needs to be more LOUD. Microphone wasn’t available, but an amplifier was, which apparently didn’t do much justice. Don’t repeat student’s sentences. If Student A is saying something (an action statement for another during an activity) and Student B doesn’t hear, I need to tell Student A “Louder please/please repeat” or tell Student B that he/she needs to pay attention. If they are used to me repeating statements for them, they won’t pay attention the first time around. Think of student’s sight line. I may have planned out how/where they’re going to sit/stand, but I need to stay out of the way if I’m blocking their view for any part of whatever is going on. Need to think of CRUCIAL SENTENCES: clarify connections. One activity may be fun, and another may fun, but how are they connected? Why is it important? Forgot most of what I practiced and prepared. Forgot to show HW page. Didn’t have active participants. Forgot to show pattern activity until much later. But my cooperating teacher… Dear God, bless her heart. She knew how to cleverly make a statement and a critique in such a way that made me feel better. She said I now established a baseline and know what to improve upon. Instead of focusing on everything that went wrong, focus on one or two crucial points and see how it can be changed and work from there. The fact that we don’t have to repeat the lesson tomorrow means that it could have been much worse. Yikes. So, I will prepare my lesson and actually type out everything I have to say/do. Even though it’s already written in the curriculum planner, and SMARTBoard slides are made, I need to get my brain used to the process. Apparently I am not as good as I sometimes think I am. The pacing of the lesson needs to be worked on; if students are focusing on something minor, such as reviewing concepts, and I spend too much time on it, I lose them, which makes it more difficult to get their attention again. Plus I need to SPEAK UP! My voice tends to be quiet (which interfered with the quality of my story reading apparently too, even though the kids were actively listening). But I feel like I’m yelling when I raise my voice, and it naturally doesn’t increase in volume THAT much. Perhaps I will ask to borrow a microphone. I need to get their attention in a more effective manner too. I forgot them all (surprise!) except for the chime that was hanging by the board and served as a visual reminder. Another post will be a list of attention-getting strategies. An exciting, chaotic, adventurous day that ended all too soon, leaving me with sore, swollen feet and a remarkable desire to do the same thing all over again the next day. Most students’ items were labeled, their math and reading packets ready to go, and morning work was on their desks. It was very touching seeing parents bring their child in and spend a meaningful minute with him or her before departing. Many parents brought required supplies such as sanitizer wipes, markers, pencils, glue sticks and tissues, which helps stock up the class for a year and then some. Parents signed up for an available time when the teacher could make a home visit. Brilliant idea, by the way. Time-consuming, yes, but so beneficial when spending just a bit of quality time with the student, getting a better idea of where student is coming from and thus better accommodating that student’s learning at school. It was very amusing watching students with their clumsy fingers tearing out homework pages for their homework folder. I witnessed them trying to find where their cubbies were, their excitement of getting to write their name using a very grown-up marker (Sharpie), sharing math ideas with their partner, punching in lunch numbers, and struggling to quietly walk down a much longer hallway than when in kindergarten. The kids loved singing “Here We Are Together” and getting their picture taken. I loved observing the individuality of each student. One student, being reluctant and shy to participate and trying to sit as close to the back of the group as possible was asked to help trace over some words on a word strip that would be taped up to the Literacy Focus Wall. After that, he apparently felt much more involved in the class, because the next time I saw him, he was sitting at the very front of the group and demonstrating model attentiveness! Another student, smart and outgoing, thought he could speak out of turn and call out suggestions and ideas. After being ignored for a while, he learned that raising his hand will generate more attention, and at one point he even had to sit and learn from his desk while the rest of the classmates were in a group. The student with selective mutism was expected to actively participate in group discussions. Since it wouldn’t be reasonable to expect her to speak at this time, she got the option of nodding to “Would you like to pass?” instead of an awkward silence. She, and the other students, will eventually know that it will be expected of her to speak. The girl sitting next to her is very animated and lively and does most of the talking for her, but the student with selective mutism is also similar, only without the words coming out of her mouth. She pays attention, writes in appropriate words, understands math concepts, and draws. She would nod or smile if I commented on some work. At recess I overheard her laughing out loud but have yet to hear words come out of her mouth. One student told me “I like you” before running out to recess. It was so sweet! The students are so naive and adorable at this point in their life, and at the same time, are so startlingly clever! I’m also so incredibly blessed to have such a great cooperating teacher to learn from! I have found a delicious gluten-free bread! My first GF bread purchase was dry, tasteless, and reminded me of crumbling bricks. 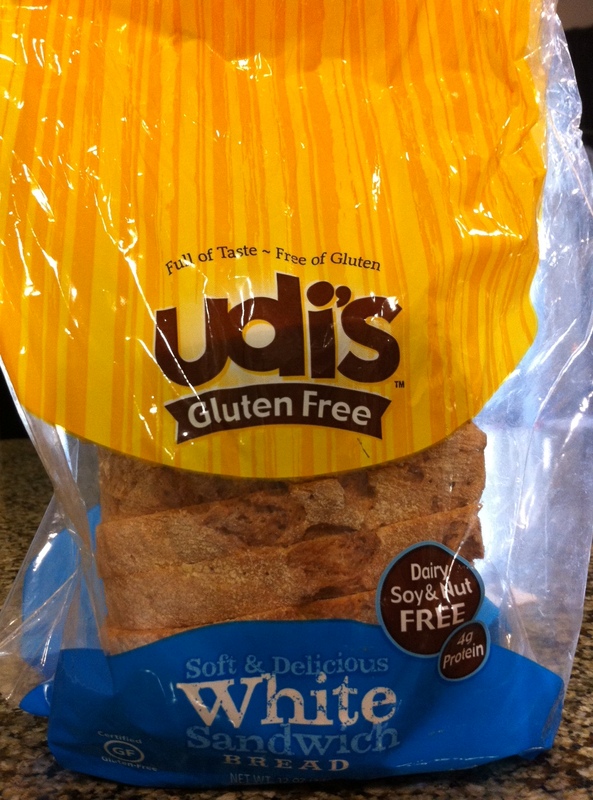 Now Udi’s bread is soft and tasty… and will most definitely cause a hole in the wallet. Whole Foods sells one package of this bread for $4.99; QFC sells it for $6.99. Very pricey 14 slices of bread. Not quite sure if it’s worth the cost. I will explore a gluten-free bakery that has recently opened within a mile of where I live and am hoping for a break in price.